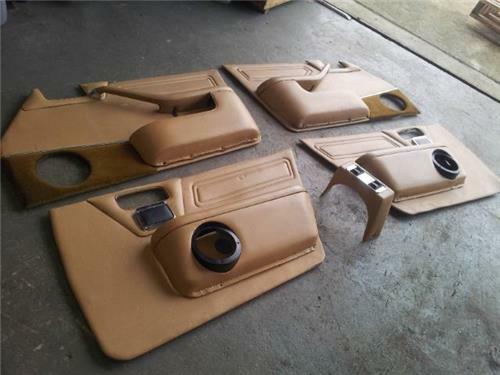 Up for sale are a set of JAGUAR Daimler XJ6 / XJ12 Series 2 LWB door tims & caps - very good condition. These were originally fitted to a Daimler XJ6 LWB Series 2 but will fit any LWB Series 2. They are more ornate than the normal Jaguar variant as the Daimler had upraded trim & will look fitted to any LWB Series 2. There are no speaker grilles fitted but you can reuse your existing speakers. The cardboard backings are very good condition & are not water damaged as most that we have seen. Please note: The rear consul switch pack that is shown in the photos with the door trims is not included in this sale. It is offered with the consul unit in a seperate listing. Welcome to inspect before purchase and remember you are bidding to own, not for the right to inspect. Can help with delivery, please supply town & postcode for quote or pick up from Penrith, 2750, Sydney.